Roast duck with parsnip puree drizzled with a rich port reduction is an elegant meal you can serve at any fine dinner party. It’s flashy enough for New Year’s Eve. And it’s not that hard to make. Do it ahead of time. Make the sauce during the afternoon. Reheat the parsnip puree over low heat. Prep the duck legs ahead of time using sous vide technique. All you have to do is brown them in a pan or under the broiler just before you serve dinner. Restaurants prep everything ahead of time. So can you. 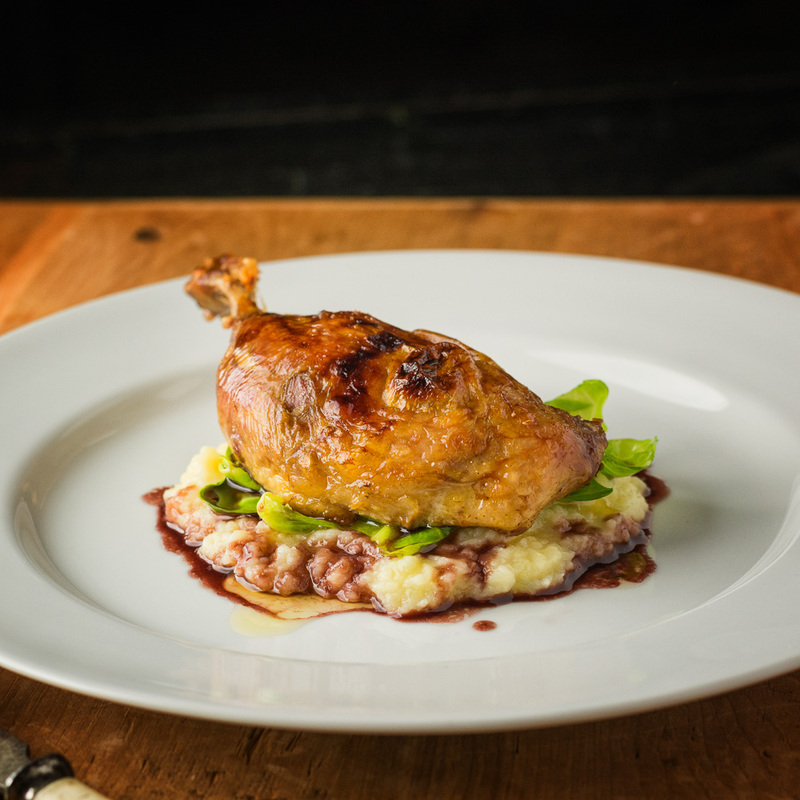 Every recipe on the Internet pushes duck confit. I love duck confit. But change is good. Variety. There’s no need to salt duck legs. No rule that says they have to be cooked in their fat. That’s just the way they were done before sous vide. Try it this way. Less salt and more pure duck flavour. Mix it up. Restaurants have been using sous vide techniques for years. The food is vac-packed (sous vide means vac-pack in French), then cooked in a temperature controlled water bath. Low cost sous vide machines like the Anova have brought this restaurant technique into the home. If you haven’t looked into sous vide I encourage you to do so. It’s a game changer. It provides consistent repeatable results every time. Restaurants use it for a reason. You get the best results using the broiler to brown the duck. You also get the biggest mess. If you can’t have your kitchen full of smoke then a frying pan is a much safer approach. Brown them in a pan and finish them in the oven. No smoke. Roast duck with parsnip puree is perfect for a fancy dinner party. Duck legs make a great alternative to the usual breasts. Vac-pack the duck legs individually. Cook, sous vide at 165F for 10 hours. Refrigerate after cooking. To warm, season generously with salt and pan fry until brown then finish re-heating in a 350F oven or broil until golden (beware of smoke). Heat the oil in a small saucepan. Add the shallots and sweat until translucent. Add the chicken stock, veal stock if using, port wine, whole thyme sprig and gelatin from the duck (this will make sense once you've cooked the duck). Reduce sauce to about 1/3 of the initial volume over medium low heat. This will take about 20-25 minutes. Strain and return to the saucepan. Add salt to taste. Stop here if you will re-heat the sauce. Just before serving heat the sauce and then, off heat, stir in 1 Tbsp butter to enrich. Cook the parsnips in salted water for 15 minutes. Add the potatoes and cook another 15 minutes. Drain, transfer to a food processor and stir in the butter and milk. Whip the parsnip puree, adding additional milk as needed to make a smooth puree. Season with salt. Brown and warm the duck. Spoon parsnip puree in the centre of the plate. Place duck over the puree. Spoon sauce around the duck. This recipe is written for two portions. It scales perfectly so just double, triple or quadruple as needed. Concentrated veal stock takes this up to the next level of wow. The brussel sprouts shown in the picture are simply a few brussel sprouts leaves barely cooked in a bit of butter. Oh wow! I never knew you could sous vide duck! You learn something new everyday. 🙂 This sounds absolutely fantastic. I will have to make this soon in the near future for myself since duck is my all time favourite meat. I have always been intimidated cook it because it always requires you to dry it out, or confit make some kind of smokey oily mess. This will be my introduction to duck at home! 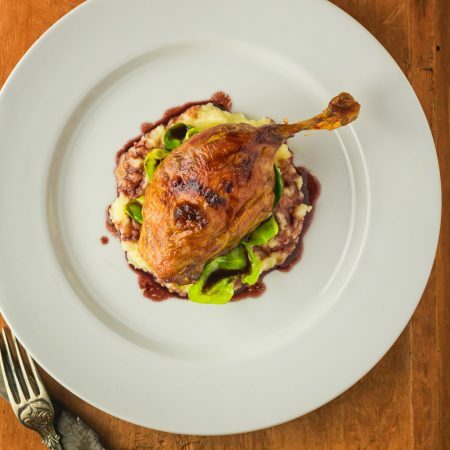 Joyce – the sous vide technique makes duck a snap. And the best part is you can make a bunch in for separate pouches and just freeze it when it comes out of the water bath.